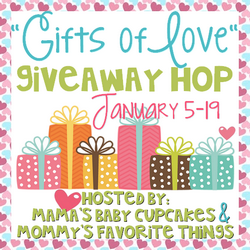 Welcome to the "Gifts of Love" Giveaway Hop hosted by Heather from Mommy's Favorite Things and Michelle from Mama's Baby Cupcakes. This hop has a Valentine's Theme, which means anything family friendly is up for grabs that you would give to someone for Valentine's Day! Each blog has a minimum prize package of $25 per winner and after visiting my giveaway, make sure you use the linky below to take a look at the other blogs to see what they have to offer for you! 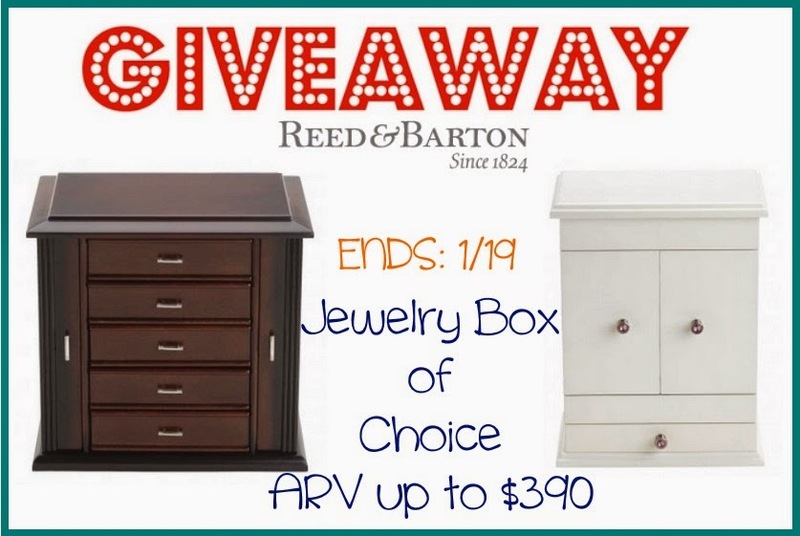 Here on Mommy's Favorite Things we have Reed & Barton, offering a Jewelry Box of Choice to one winner! We received the Bella Jewelry Box for my daughter. She got it for Christmas and loves it so much! 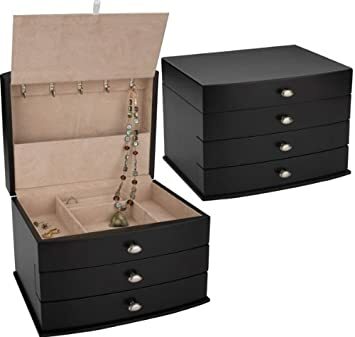 It has a top that lifts up, a drawer at the bottom and a middle section with necklace hooks, and 4 small compartments. Overall, I'm loving the Bella Jewelry Box! This jewelry box is surely to last a long time. It it high quality and I hope it will last my daughter years and years to come. I love the pink jeweled knobs it has, it adds just a touch of girly to the white finish. My daughter also got a white finish night stand for Christmas and this looks perfect sitting on top of it! She really loves it and it's the perfect storage for her jewelry now. I'm also loving that it has a mirror too. Perfect for her to put in her own earrings. Reed & Barton has lots of styles of Jewelry boxes to choose from! Price: The Bella is $90, but they range from $48-$390 depending on what you need. Overall: ***** I have high regard for the Reed & Barton brand and I hope I get to try out more stuff soon! If I had a choice I would choose the BRIELLE it is very elegant. I like the Carrie Jewelry Box. I like the high gloss finish pearl! The Rosewood is just beautiful. It would definitely have a special place on my dresser for sure. i like the DIVA Jewelry Box. These jewelry boxes look really nice. I think i might choose the DIVA one. I really love the Athena jewelry box in cherry. The Rosewood would look great in my bedroom. They are all very nice. I would probably choose their Ballerina musical jewelry box. I remember getting my first jewelry box like this; my daughter would love it. I would choose the High Gloss Finish Pearl White Jewelry Box if I win. These jewelry boxes are gorgeous! So many pretty ones! I do love the "Diva". Modern Lines Jewelry Box, Espresso. I really love the Brielle! Very simple and stylish. I was gifted a lovely jewelry box a while back, by my kids.. I have a LOT of jewelry, I'm a sucker for vintage stuff- I found a lot of goodies over the years at garage sales! And I have two of the grandkids who share my love of vintage things, and rhinestones! LOL I would LOVE to win this, and gift it to one of them in particular. I would choose the Linda.. she would love it!! SO pretty! so useful! I might choose the SOPHIA. Boy! This is a very hard decision!!! I love the Diva jewelery box, it has enough room for most of my jewelery. I really like the Sophia Jewelry Box, really classy looking and would fit many pieces of jewelry. They have so many great ones that it's hard to choose, but I think I really like the Amelia and the Bella. I would choose the Selene Box. I would choose the Ballerina jewelry box for my youngest daughter. I've wanted to get her one like that for a long time. If I won a Jewelry Box from Reed and Barton I would choose the Duchess II Jewelry Box, Cherry. This is the most beautiful Jewelry Box I've ever seen and I would love to put some of things I treasure the most in it. The Jewelry Box also matches our bedroom furniture so it's a win, win! It matches my heart and my bedroom. The Colonial jewelry box is my favorite while my young daughter loves the Bella style. I would choose the Diva Jewelry Box. The ATHENA in Cherry is just gorgeous! I would pick the Fairy Princess for my great granddaughter. She could use this for along tine before having to get something bigger!!! I'd choose the Tayloe Jewelry Box. It's so very pretty! I would choose the, High Gloss Finish Pearl jewelery box. I'm torn between the Rosewood one for myself and the Secret Princess one for my daughter. My box needs to be replaced and she doesn't have one yet. I absolutely love the "Bella" jewelry box! It is so pretty and unique...and it doesn't hurt that my granddaughter's name is Isabella! If I won, I would pick the Rosewood box. It is beautiful!! I like the Rosewood jewelry box. I'd pick the Selene jewelry box. If I won I would probably choose the Brielle jewelry box. Jewlery Box for my sweet little grand-daughter. I love the look of the Queen Mary jewerly box. I like the Linda jewelry box. It has lots of storage for jewelry in a compact setting. I love the Bella jewelry box for our dd! I would choose the Linda jewelry box. I LOVE the Athena in mahogany! I like the Sophia jewelry box. I live the rustic look of the selene. I like the Linda jewelry box, I would give it as a gift to my mother. I'd probably pick the Avery or the diva. I would choose the very elegant looking Sophia. I would probably choose the DIVA Jewelry Box. The selection of the Jewelry Boxes is great. My favorite is the DIVA Jewelry Box. I like that its made out of Mahogany and has 5 drawers and two side doors with magnetic catches. It's a beautiful Jewelry Box. I like the Linda jewelry box because it seems like it can hold the most necklaces. It's hard to choose! I like the Natural Instinct box in Espresso. I like the Athena Jewelry Box in Mahogany. I really like the Selene Jewelry box. I would choose the Bella Jewelry box, my nieces would love it! I would choose the Athena jewelry box. I like the Hannah Jewelry Box. Thank you!! I love the look of the Selene jewelry box. If I win I might choose the Amelia jewelry box. I would choose the Athena jewelry box in cherry. I like the Selene. I really like the look of natural wood. If I win, I would probably choose the jewelry box called Amelia. It's very beautiful. I love the Diva.. it would be perfect for my daughter who has outgrown her little girl jewelry boxes. I would like the Tayloe box. It is beautiful. I think I would pick the Hannah jewelry box for my daughter. It is a good size and it matches the furniture in her room. I think I would get the Elena Box. It looks so beautiful and classic looking. I like the Avery jewelry box. Very pretty. HIGH GLOSS FINISH POPPY is such a pretty color. I would pick the Bella. Modern Lines Jewelry Box, Espresso, since it locks. I would choose the SELENE. Love the color. Beautiful! The Hannah jewelry box is simple and gorgeous. I would love to gift it to my mom if I won. Athena (in Cherry) is lovely, but because I have quite a few necklaces, I think I'd go with Brielle. Is such a beautiful box love the wood its made from great design. I really like the Brielle. It is taller and classy looking. I would like the Tayloe. Thanks for the chance! I really like the Selene and the Diva jewelry boxes! I believe I would choose the DIVA. The compartments are just perfect for what I am looking for. I like the Sophia box. I would choose the Selene jewelry box. I might choose the BRIELLE jewelry box from Reed and Barton if I won. My favorite is Selene. Love the color of the wood! I might choose the Tayloe Jewelry Box if I win. I likethe "Hunter" model jewelry box. I would choose the Linda box.It is perfect and so beautiful! I just love the TAYLOE jewelry box, unique and beautiful! Hello, I haven't really made my mind up and it might change but I love the Selene Jewelry Box. Thanks for a great giveaway! Hello! I would most likely choose the Princess II jewelry box. So nice! Thank-you for this generous chance!! I love the Athena Jewelry Box in Cherry! I like the Selene Jewelry Box. My favoirte is the high gloss in midnight. I love the HIGH GLOSS FINISH PEARL. It would fit nicely on my nightstand. I would choose the ballerina musical box for my granddaughter. She is a little ballerina. I might choose the Women's Hunter Jewelry Box. I love the Linda jewelry box and the Colonial jewelry box. I would love the white bella jewelry box for my daughter. The Bella and the Brielle would be wonderful jewelry boxes. I like the Brielle jewelry case and the Linda jewelry case. The Selene box is really unique and I think I would go with that one. my favorite is the Linda Jewelry box. I love the Kira jewelry box. If I were to win, I would choose the BRIELLE! It is beautiful, functional, and would look lovely in my bedroom! I would probably choose the gorgeous Queen Mary box! I love the antique look of the Selene. I also love the Diva because of the necklace compartments on each side. It would be so hard to choose. I would get the rosewood or sophia. I would love the REGAL. I like to collect wood boxes, but don't have a Mahogany jewelry box yet. i really like the VICTORIA jewelry box, plus its the name of my granddaughter! Boy, this is hard! I think I'd go with Linda, but they have a great selection. I would choose the Linda Jewelry Box. It has everything I could want! I like the TAYLOE jewelry box. I really like the Hunter Jewelry Box. I like the Rosewood box. I like the Diva Jewelry Box. I like the way the doors open. Item #690MC from Reed & Barton. I'm really loving the BRIELLE or the Linda jewelry box. I had no idea they had so many! I would probably choose the Bailey or Avery design. I would choose the Selena womens jewely box. I would choose DIVA. Thanks for the chance! I would choose the Ballerina Musical Jewelry Box for my daughter. I think the Selene box is pretty gorgeous. So hard to select. I adore Selene and Avery, but think that I would select Selene. I love the Amelia jewelry box. I would love to have the Athena Jewelry Box in Mahogany. Item #664MR. I think it is pretty. I would choose the Tayloe Jewlery box. I would choose the Brielle jewelry box. I would choose the Tayloe Jewelry Box. I think I would choose the Diva. If I won I'd give it to my roomie. She's a jewelry nut. I let her look and she liked the SOPHIA best. I would choose the Mahogany Athena Jewelry Box. I believe the Rosewood is my favorite. I would love to receive the Ameila jewelbox. I love the Linda Jewelry Box!